In the rating system of the British Royal Navy used to categorise sailing warships, a fourth-rate was a ship of the line with 46 to 60 guns mounted. A fourth-rate was, in the British Royal Navy during the first half of the 18th century, a ship of the line mounting from 46 up to 60 guns. While the number of guns stayed in the same range until 1817, after 1756 the ships of 50 guns and below were considered too weak to stand in the line of battle, although the remaining 60-gun ships were still classed as fit to be ships of the line. However, the 50-gun ship continued to be used largely during the Seven Years' War, and during the time of the American Revolution a whole new group of 50-gun ships was constructed, not for the battlefleet, but to meet the needs of combat in the shallow waters off North America where the larger ships found it difficult to sail. 50-gun ships were also suitable as convoy escorts and for service on foreign stations, where larger enemy vessels were unlikely to be encountered. Some saw service as flagships since, as two-deckers, they were able to accommodate a flag officer and his retinue, and they also had the physical presence of a flagship. Their usefulness was declining, however, and during the French Revolutionary and Napoleonic Wars few 50s were built, although several remained in service, especially on distant stations such as the East Indies. The 60-gun ships were also dying out, superseded initially by the 74-gun third-rates, although by 1793 there were still four 60-gun ships left in harbour service. Some fourth-rates did remain in active service even during the Napoleonic Wars, especially in the shallow North Sea, where the Royal Navy's main opponents were the Baltic powers and the Dutch, whose own fleet consisted mainly of 50- to 64-gun ships (e.g. the 56-gun Delft). However, HMS Leander, 50 guns, was with Horatio Nelson at the Battle of the Nile. As late as 1807, fourth-rates were active in combat zones, illustrated by the fatal incident between HMS Leopard (50 guns), and the US frigate Chesapeake (38 guns), an incident which nearly led to war. American 44-gun frigates Constitution, United States and President were never in operational use armed with fewer than 50 guns including carronades, and were generally seen as equivalent to fourth-rates. The larger British 24-pounder frigates such as the later 1813 Leander and Newcastle, were of similar firepower to those big American 44s. The latter were launched (or razéed - i.e. converted by cutting down by one deck from existing smaller third-rate 74-gun two-deckers) during the last years of the Napoleonic War and the War of 1812 and were classed as fourth-rates in Royal Naval service under the revised rating system. This convention continued into the 19th century. Any of these later large fourth-rate frigates threw a close-range broadside (including from their heavy carronades) far superior to the earlier two-decker 50s or even to third-rate 64s, and could perhaps be considered comparable in function to the battlecruisers of more recent times. Some ships of commerce such as the East Indiamen were heavily armed in order to protect themselves from pirates and privateers, effectively making them equivalent to fourth-rate ships of the line. The Royal Navy also converted some East Indiamen into fourth-rates for convoy duty, such as HMS Calcutta. Rodger, N.A.M. The Command of the Ocean, a Naval History of Britain 1649-1815, London (2004). ISBN 0-7139-9411-8. Bennett, G. The Battle of Trafalgar, Barnsley (2004). ISBN 1-84415-107-7. Winfield, Rif, British Warships in the Age of Sail: 1603-1714, Barnsley (2009) ISBN 978-1-84832-040-6; British Warships in the Age of Sail: 1714-1792, Barnsley (2007) ISBN 978-1-84415-700-6; British Warships in the Age of Sail: 1793-1817, (2nd edition) Barnsley (2008). ISBN 978-1-84415-717-4; British Warships in the Age of Sail: 1817-1863, Barnsley (2014) ISBN 978-1-84832-169-4. Winfield, Rif, The 50-Gun Ship (Chatham Publishing, 1997) ISBN 1-86176-025-6. In the rating system of the British Royal Navy, a third rate was a ship of the line which from the 1720s mounted between 64 and 80 guns, typically built with two gun decks. Years of experience proved that the third rate ships embodied the best compromise between sailing ability, firepower, and cost. So, while first rates and second rates were both larger and more powerful, the third-rate ships were in a real sense the optimal configuration. In the rating system of the British Royal Navy used to categorise sailing warships, a first rate was the designation for the largest ships of the line, equivalent to the 'super-dreadnought' of more recent times. Originating in the Jacobean era with the designation of Ships Royal capable of carrying at least 400 men, the size and establishment of first-rates evolved over the following 250 years to eventually denote ships of the line carrying at least 80 guns across three gundecks. By the end of the eighteenth century, a first-rate carried not less than 100 guns and more than 850 crew, and had a measurement (burthen) tonnage of some 2,000 tons. 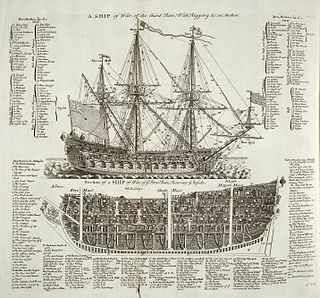 In the rating system of the British Royal Navy used to categorise sailing warships, a second-rate was a ship of the line which by the start of the 18th century mounted 90 to 98 guns on three gun decks; earlier 17th-century second rates had fewer guns and were originally two-deckers or had only partially armed third gun decks. In the rating system of the British Royal Navy used to categorise sailing warships, a sixth-rate was the designation for small warships mounting between 20 and 28 carriage-mounted guns on a single deck, sometimes with smaller guns on the upper works and sometimes without. It thus encompassed ships with up to 30 guns in all. In the first half of the 18th century the main battery guns were 6-pounders, but by mid-century these were supplanted by 9-pounders. 28-gun sixth rates were classed as frigates, those smaller as 'post ships', indicating that they were still commanded by a full ('post') captain, as opposed to sloops of 18 guns and less under commanders. The rating system of the Royal Navy and its predecessors was used by the Royal Navy between the beginning of the 17th century and the middle of the 19th century to categorise sailing warships, initially classing them according to their assigned complement of men, and later according to the number of their carriage-mounted guns. HMS Gloucester was a 74-gun, third rate Vengeur-class ship of the line built for the Royal Navy in the 1810s. She played a minor role in the Napoleonic Wars and was cut down into a 50-gun fourth rate frigate in 1831–32. The ship was converted into a receiving ship and broken up in 1884. HMS Milan was a 38-gun fifth rate frigate of the Royal Navy. She had previously been Ville de Milan, a 40-gun frigate of the French Navy, but served for only a year before being chased down and engaged by the smaller 32-gun frigate HMS Cleopatra. Ville de Milan defeated and captured her opponent, but suffered so much damage that she was forced to surrender without a fight several days later when both ships encountered HMS Leander, a British fourth rate. Milan went on to serve with the Royal Navy for another ten years, before being broken up in 1815, after the conclusion of the Napoleonic Wars.